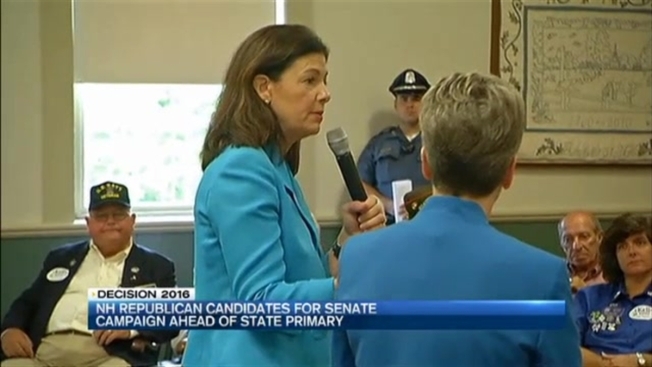 Sen. Kelly Ayotte went through her Friday campaign events with an out-of-state guest: Iowa Sen. Joni Ernst. "Who was one of the earliest supporters of the Iran nuclear deal?" Ernst asked a room full of veterans. "Maggie Hassan." Hassan, New Hampshire's governor, is Ayotte's Democratic general election challenger -- but first, Ayotte has a Republican opponent in former state Sen. Jim Rubens she needs to beat in Tuesday's primary. "I'm running to provide Republican voters with an alternative, because Kelly Ayotte and Maggie Hassan are so similar," Rubens said. Rubens, a conservative, running to Ayotte's right, describes Ayotte as a big-spending moderate who votes like a Democrat for amnesty for the undocumented and to raise the debt by trillions of dollars. "I'm saying she's a bipartisan capitulator," Rubens said. "She has caved into the Washington machine." Not true, says Ayotte, who touts herself as an effective bipartisan - standing up to the Obama administration on key issues, including her opposition to the Iran nuclear deal. "This is a great contrast, not only to Secretary Clinton, President Obama, but Gov. Maggie Hassan in this race," Ayotte said. For Ayotte, this race is all about beating Hassan - there is little to no acknowledgment of Rubens. Polls show that is probably a good strategy, given that she has trailed Hassan in some polls while a majority of voters, 62 percent, are not aware of Rubens. Asked if he can turn the race around by election day, Rubens said, "I'm not the establishment-approved candidate, but I do know that voters are saying one thing in public and are going to vote differently on Tuesday."